For furnaces to operate efficiently and to maximum capability, they must stay in good working order. Elmelin specialises in furnace safety systems to help ensure furnaces are not vulnerable to damage, breakdown or diminished performance. Vapourshield – a mica-based laminate with the additional property of preventing hazardous fumes penetrating the furnace’s coil grout. Both act to give an early warning where there is potential damage to the furnace. 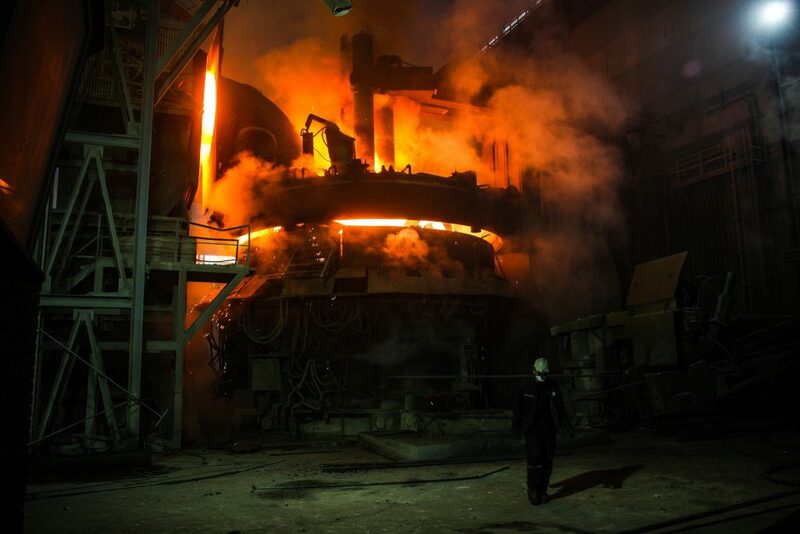 In coreless induction furnaces, there is the risk that the metal being processed will penetrate close to the induction coil as the crucible starts to wear thin with regular use. The risk is that metal penetrating the coil can lead to a furnace erupting, or even exploding. Furnaces with integral crucibles that are cast in situ will normally have an earth leakage detector. This is crucial when it comes to safe melting and holding operations. The earth leakage detector offers important protection against electric shocks while warning of metal-to-coil penetration. We have developed Elmesh as a means of improving on this. If you connect Elmesh to the earth leakage detector, you then get an early warning system, which will let you know if there is any breach to the furnace lining. Where foundries are melting difficult and varied materials such as scrap metal, this early warning means they can shut-down before any damage to the coil or coil grout. Elmesh combines a layer of phlogopite mica with a layer of non-magnetic, stainless steel mesh in a flexible laminate sheet. We produce it in rolls, making it easy to ship and apply. It is available in a 0.80mm thick grade, in rolls that are 12.5mm or 25mm long. Roll widths come as 1060mm or 1000mm, depending on whether you opt for an exposed mesh edge of 25mm on one or both sided of the roll. This choice means you can get maximum yield, depending on the size of furnace where you are applying Elmesh. This mica-based laminate range combines protective qualities with a superior early warning sensor function. Where furnaces encounter problems with metal vapour leaving deposits on the coil, Vapourshield will prevent this occurring. It is especially useful for furnaces which aim to process large quantities of galvanised scrap content. Galvanised metal presents a challenge to foundries, because its coating, consisting primarily of zinc, give off a fine zinc oxide dust during the melting process. Emission control is therefore vital, but so is ensuring the best performance of the furnace, and where the zinc oxide settles it can impede the coil’s performance, leading to short circuits and equipment misreadings. Zinc oxide can also affect the quality of the melted metal, leaving gas cavities that form gaping holes. An earthed Vapourshield core will also act as an early warning alarm for metal that is close to penetrating the coil or coil grout. It is also an effective, if temporary, barrier to actual metal penetration. Foundries are often tasked with melting copper alloys with different chemical components, which may cause misreadings in electrical monitoring during the melting process. Similarly, scrap metals with high impurity levels may cause furnaces to shut down, and lead to the frequent replacement of coils. Vapourshield is the ideal solution to these and other furnace problems, addressing both productivity and health and safety issues. Do not put your furnace, or the people working in it, at risk. Ensure your furnace’s safety and consistent performance with Elmelin’s furnace safety systems.